The cherry harvest was at its fullest this year, which I suppose is expected as a wee tree grows larger. 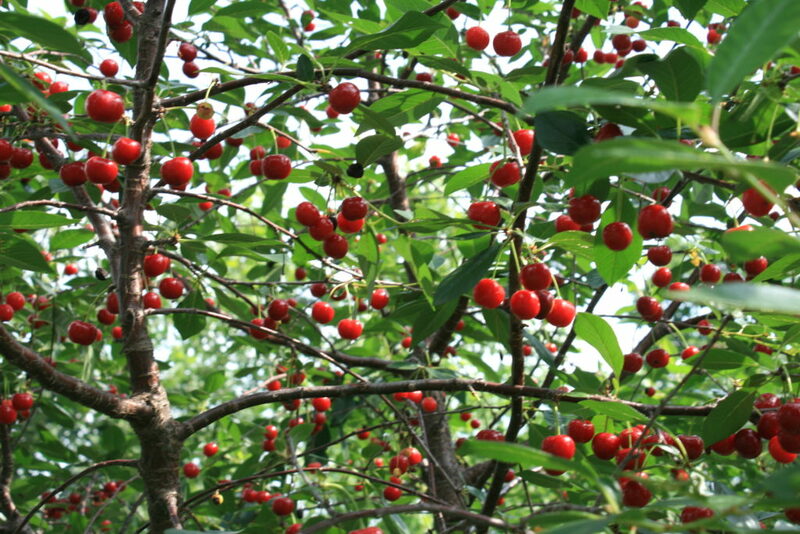 We ate them by the handful, made many a cherry clafoutis and were still able to put away 2.5 gallons in the freezer. So busy we were (including my visiting mother-in-law) with picking and pitting all the cherries, that I was a little caught off guard when the raspberries began ripening. 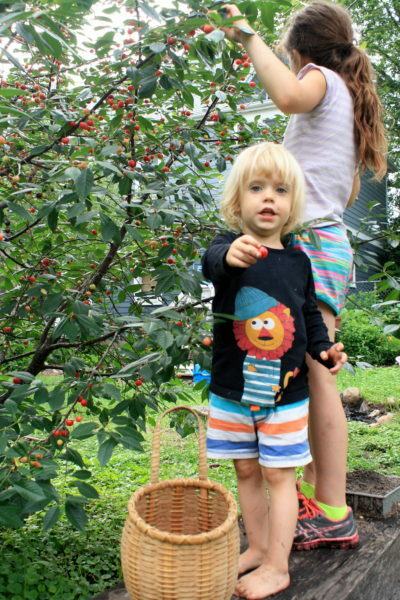 Soon, the entire fence line was begging to be picked, and oooohhhh that’s a lot of berries. Well, I kept on pitting and freezing the cherries, while also snacking on fresh raspberries. Let me just say – you have really got to love cherries to pit all those cherries. Or simply be the type of person who doesn’t like to sit still. Or both, both seems to really be the winning combination. I finally finished with the cherries, gave the raspberries a bit more attention, but swiftly moved onto rhubarb, while still taking raspberry-picking forays for dinner dessert. Yes, yes I know rhubarb is technically a vegetable, but here, it enjoys fruit-like status. I had harvested rhubarb for pies a few times in June, but there was still plenty more to pick before the heat carried on too long. 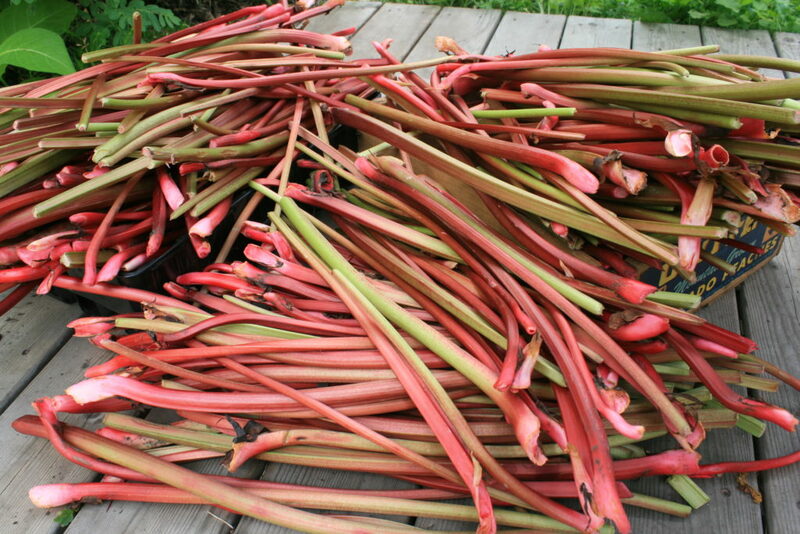 Aaaaand pick I did – I brought in 40 lbs of rhubarb (that’s sans leaves, folks)! Whew! I love, love rhubarb and I was determined to put it all up. I soon abandoned these ridiculously too-small crates and FILLED a 25 gallon rubbermaid tub! I made a double batch of this amazing rhubarb marmalade for a whopping 22 half-pint jars on my canning shelf! Next, were two rhubarb ferments – One, a half-gallon jar filled with rhubarb, ginger and cardamom from the book Fermented Vegetables. 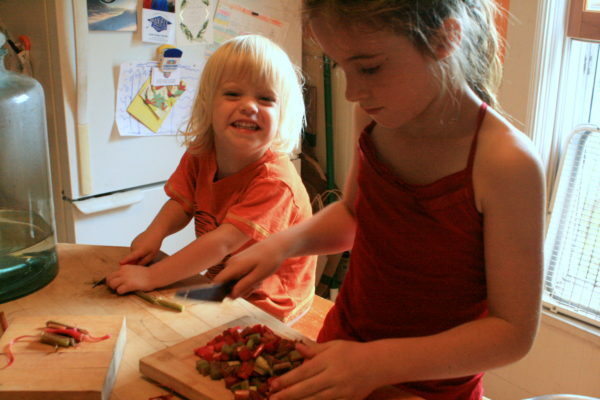 The other, an interesting take on kimchi based on this recipe but quadrupled in size and toned down in heat for the kiddos. 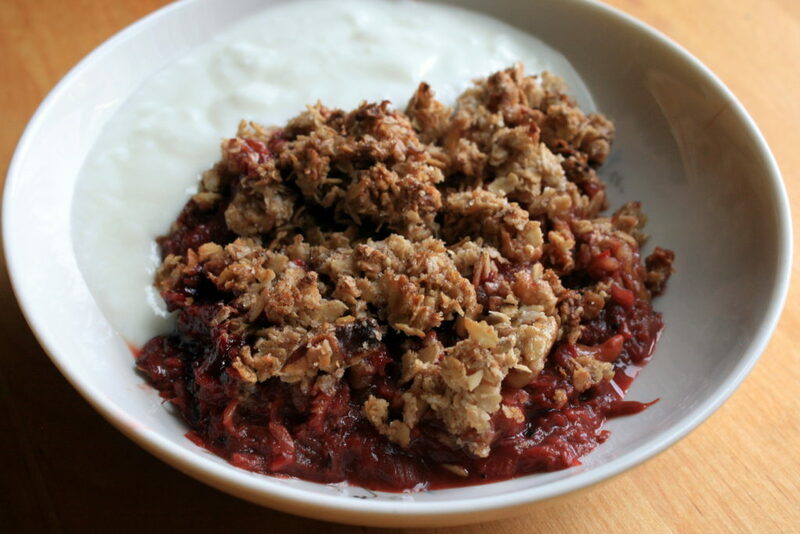 We may have also, ahem…eaten rhubarb raspberry crumble for breakfast. It was actually healthy, I promise! In between all the making, R and I chopped and chopped and chopped to put tray after tray through the freezer. Well, here’s eager E, too. He was so excited to have a knife and chop with us! Can you imagine the state of my freezer after all this fruit harvesting?! It’s looking to be a delicious winter! I have been so busy with these tasks that I hardly missed the fact that we didn’t get a strawberry harvest this year due to re-planting the bed in May. 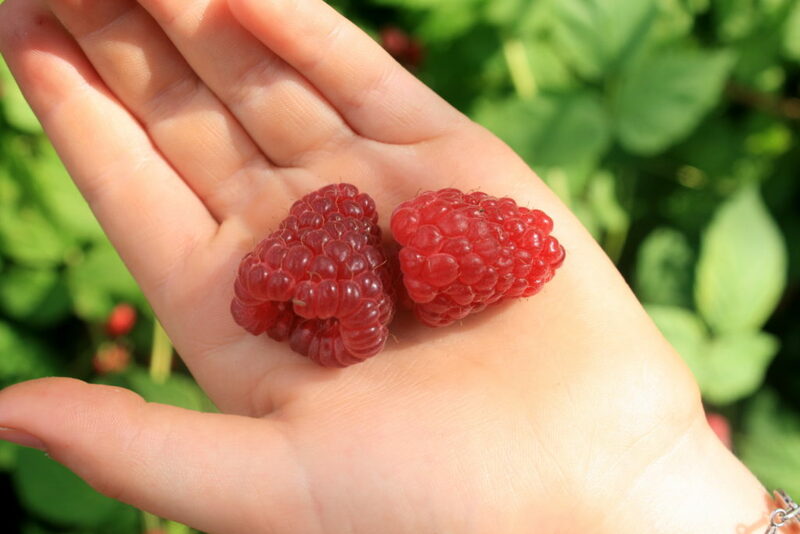 The work is not over yet, though: more raspberries are coming and both the white and red currants have been ripe and waiting! Fingers crossed I can wrap up all this fruit harvest before the cucumbers and tomatoes start rolling in. It’s a short growing season here in Minnesota, but we sure pack a punch. Do you grow any fruit? What are you harvesting from your garden right now? I’m exhausted just reading this! Thank you for the recipes and motivation. WAY TO GO on all that harvesting and cherry pitting — yikes. Thank you so much! Best of luck to you and your gardening work!